If i use 12V DC power to light the led via relay its working fine. if again use 240V power to relay to light bulb i'm get same error again. I have already tried using ceramic capacitor for decoupling to avoid noise from AC. Still no luck. Please advice. I'm very new and naive at handling electronics. Adding the circuit as well. Update: After further testing, I can see following behaviour, If i connect AC bulb to relay and turn it on. Then by provide a long gap before turning it off makes the ESP stable for longer time. Even better, if i turn off/on my mobile wifi between each time i turn on or off the AC bulb then ESP is always stable. Adding my code as well. To prevent EMI and to save the relay contacts, you could switch the relays at AC zero-crossing. Add some kind of zero-crossing detection to you project and before switching a relay, wait for a zero-crossing and then wait just before the next zero crossing (about 9500 microseconds at 50 Hz AC). Simple is to use a current sensor to detect zero-crossing. Current AC wave should be aligned with the voltage wave, if there is no shift in power factor. Not the answer you're looking for? 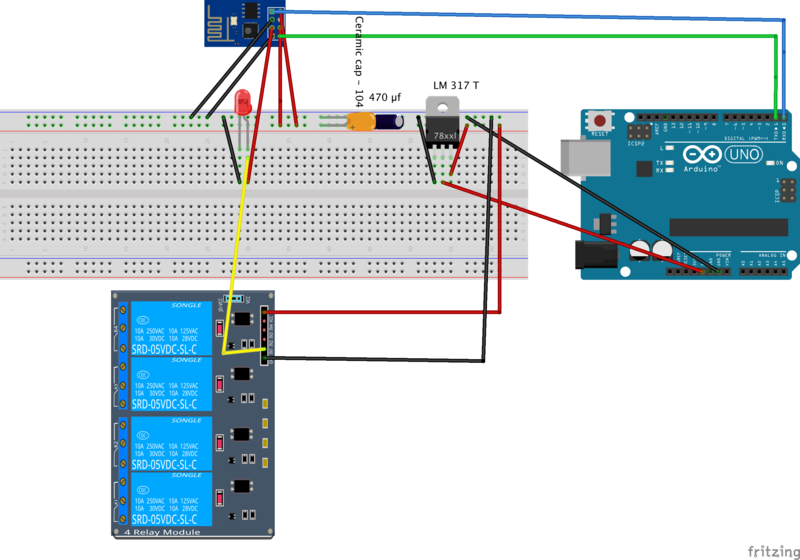 Browse other questions tagged arduino-uno esp8266 relay or ask your own question.